It wasn’t until 1884 that Virginia’s General Assembly established a state anatomical board and addressed the issue of body snatching as related to medical schools’ procurement of dead bodies. The anatomy act allowed medical colleges to legally take possession of certain unclaimed bodies, such as those of paupers and prisoners. Even though medical schools had access to executed criminals’ bodies before the anatomy act, the demand for corpses far surpassed the supply. The aspiring physician relied largely on “resurrection men” to provide labs with a fresh and steady supply of cadavers to quench his thirst for anatomical knowledge. Resurrection men (also known as ghouls, body snatchers, grave robbers, and anatomical men) frequently toiled under the cover of night when they could disinter and deliver a fresh corpse with little chance of detection. The gruesome nature of the trade was offensive to the general public, but body-snatching was considered a necessary evil to those in the medical profession. Newspaper accounts of body snatching suggest that the majority of the bodies stolen were from African-American cemeteries. 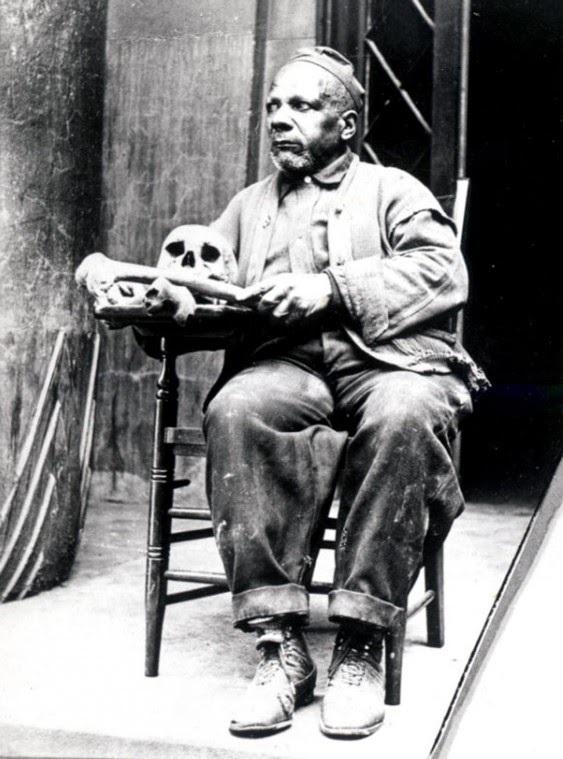 Chris Baker was one such anatomical man employed as a janitor at the Medical College of Virginia in the late 19th century. 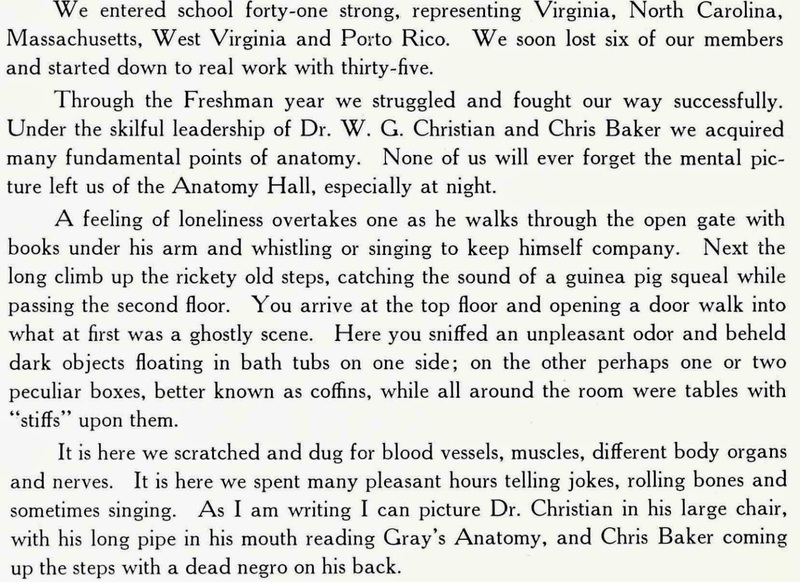 Baker, an African-American man who frequently donned a black skull cap over his balding head, was photographed on several occasions with medical students in the dissecting room, evocative of the reverent relationship he had with MCV students and staff. That particular relationship and his role in supplying the college with mostly African-American corpses unfortunately made him an outcast to members of his own race and prevented him from venturing far from the MCV campus during his post-grave robbing years. When examining Baker’s life it’s often difficult to separate the fact from the fiction. After his highly publicized 1882 arrest for grave robbing he became legendary in the Richmond area. It’s likely that many accounts of his body snatching exploits were embellished or completely made up by attention-seekers wanting to become part of the legend. Some sources, such as historical newspapers, census records, or medical college yearbooks, hopefully shed more reliable light despite a few minor discrepancies. Demographic information about Baker varies on just about every detail, including his year of birth. 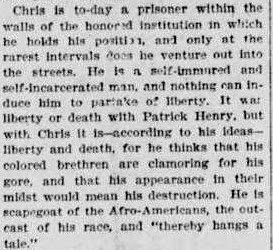 From the Richmond Dispatch on October 29, 1893: “… he had practically been born and bred at the college. His mother has been a laundress at the institution for years, and still does work there. Chris has been janitor at the college for fourteen years. He has seen 47 summers and is a married man with several children.” If that article was accurate then Baker was born around 1846. According to the 1900 and 1910 census records, though, he was born in 1860 and only had one child, John (born in 1895). The Senate Joint Resolution No. 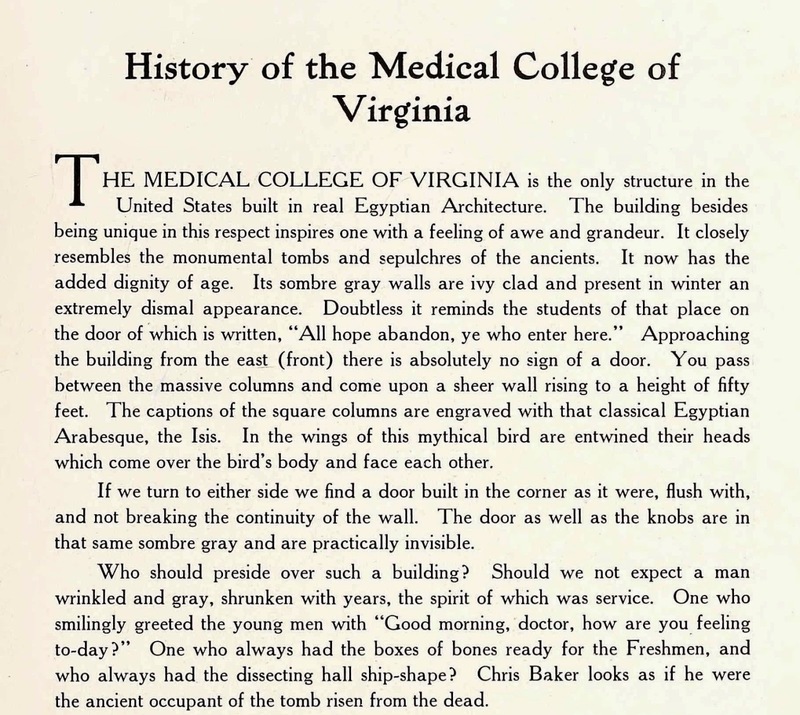 84 regarding the work of Richmond’s physicians in the 19th century, asserts that Baker, whose slave status at the time of employment was unknown, worked at MCV in the late 1860s. That would make it unlikely that he was born in 1860. At any rate, it’s generally held that Baker resided somewhere on or in very close proximity to the MCV campus. The total number of bodies stolen by Baker and his cohorts is a mystery, but if he was engaged in the illegal corpse trade from the 1860s until the 1880s, chances are that he hauled quite a few stiffs between the cemeteries, alms houses, and the medical school. 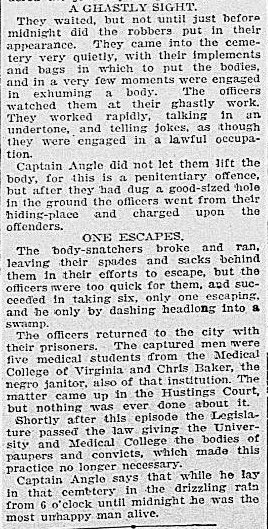 The reporter who wrote the Richmond Dispatch feature recorded: “In vain I tried to get Chris to tell me the number of bodies he had stolen, but he was just as evasive as a politician, and pretended that he didn’t know.” In December 1882 Baker, his African-American assistant Caeser Roane and Caucasian medical students William Meredith and William Smith were arrested in Oakwood Cemetery. (Read the indictment here.) Baker and his associates plead guilty to a lesser misdemeanor and were sentenced to six months in jail. All four were pardoned by Governor Cameron and set free by the end of the month thanks to the influence of the medical community. 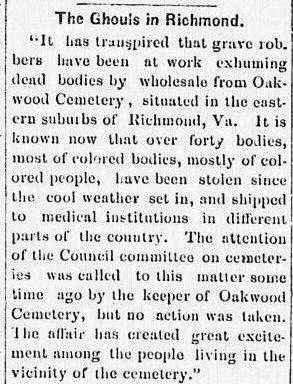 Baker’s arrest revived public interest in Richmond’s grave robbing problem. 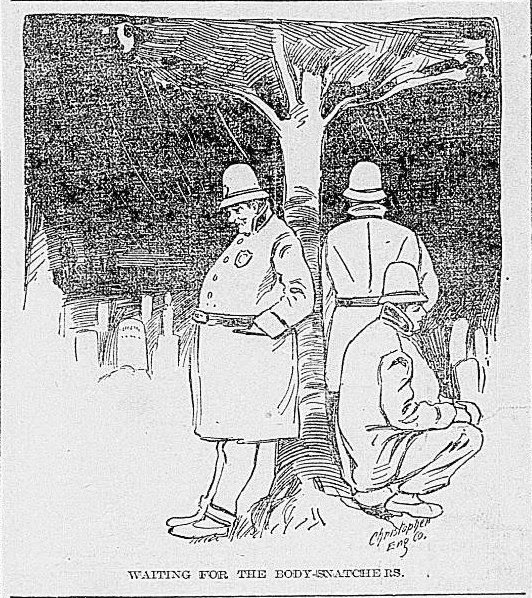 A newspaper ran an article rehashing an incident in which Baker had been implicated by two unnamed ghouls in conjunction with the disinterment of Clay Lomax’s body in Sycamore Cemetery the previous January. There was no evidence that he was actually involved in the Lomax affair and because the posse allowed the body-snatchers to rebury the body and leave, no arrests were ever made. 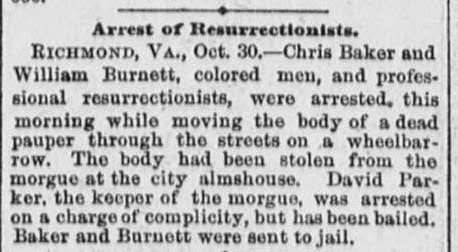 On the morning of October 30, 1883 Baker and fellow resurrection man William Burnett were caught rolling an allegedly stolen almshouse corpse in a wheelbarrow brazenly through the Richmond streets. As eerie as this event was, the image carries a certain dark, comical absurdity. Public outrage against grave robbing pressured the police to stake out Richmond cemeteries in hopes of catching ghouls in the act. In 1900, Captain J.B. Angle recalled one rainy night years prior when he and other officers watched Oakwood for hours before Baker and his associates showed up to do their bidding. 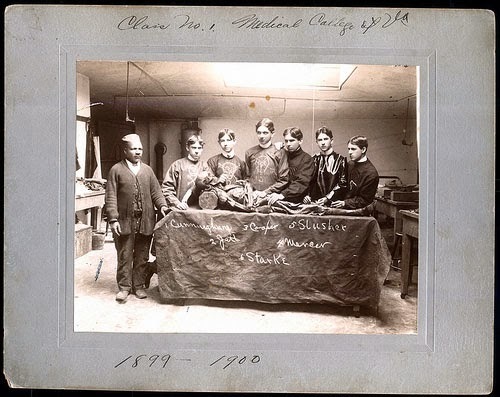 Baker, who could neither read nor write and signed his name with an “X” was said to be just as knowledgeable about human anatomy as the students with whom he assisted in the dissecting room. As mentioned earlier Baker became a pariah in the African-American community, earning him the nickname of the “boogeyman” and stirring up unfounded rumors among the superstitious that he practiced black magic and attended funerals to scope out potential subjects for the dissecting table. He feared retribution at the hands of his peers and spent the majority of his time as a “self-incarcerated man” inside the medical school. 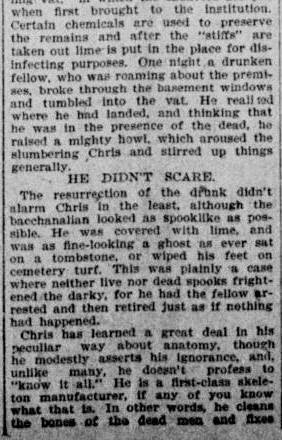 Chris Baker died in his home on-campus on June 8, 1919 and buried in an unknown location on the grounds of Richmond’s Evergreen Cemetery. Most reports indicate that he was around 70 when he died, which is remarkable considering the amount of time he spent around the toxic chemicals involved in preserving bodies and organs. Respected by some and hated by others, Chris Baker went down in the history with the stigma of a “ghoul” while some of his white grave-robbing partners went on to become prosperous surgeons and doctors.Despite this, his contributions towards the advancement of medical science are worthy of appreciation and further exploration.